Shimmer Waves can be swept together for an all-over glow, or use individually to accent particular areas, making it the ultimate in compact colour! Availability: The Body Shop stores. I first bought this compact a couple of years ago when I went on a hunt to find a blusher that gives my cheeks the perfect pink shimmer. I immediately fell in love with the product. 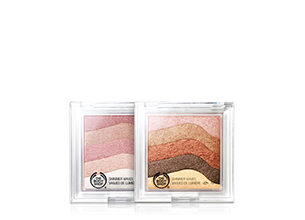 Some people don’t like this format of blusher because it combines different colours in one compact. I really like it, because I find I get a unique colour on my brush. I swirl my blusher brush around the compact, allowing all the colours to get onto the bristles. When I apply it to my skin, I get a glowy shade of pink that’s completely unique because of the different shades mixed together. I love that the colour lasts all day and that you need very little with each application – the compact lasts for ages! If you’re tanned or dark of complexion, I would suggest you try the bronze Shimmer Waves. Unfortunately the colour makes my pale skin look a bit dirty, so I’ll stick with the pink! This is a great product that gives you an amazing glow. You can use as many colours as you like, mix them all together – great to play with and find a look that suits you. Long lasting and so easy to use. I even used it as an eyeshadow (works wonderfully!) SO happy with it- and would definitely invest in it again. When I tested this out, I realized that it’s not only a bronzer, but it can be used as an eyeshadow too. The colors are so beautiful , it has a very soft feeling to it and once applied, then only do you get to see how gorgeous it looks on. I liked the bronzer more than the highlighter, I find it to be deeper in color and actually worked well with my skin tone. I recently got into bronzer/blushers trend because, well, I thought my complexion was too deep for that. I bought this after debating it out in my head. I don’t know why I delayed. This little-friend of mine is so great at giving me a summer ready highlight. And it photographs so well! I use the different shades as eye-shadow. The lightest gold works so well to highlight the inner corners of my eyes. I love how this powder makes my skin look. It gives it a shimmery glow. The colour is buildable and you can use each shade separately if preferred. Ive used this as an eyeshadow a few times as well. Great product although it is a little pricey. But I would recommend it.